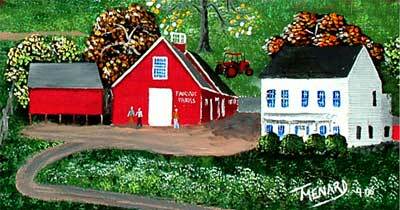 Fairvue Farms is featured in local artist Tom Menard's Celebrating Agriculture painting (portion shown above). The entire painting appears on the label of Taylor Brooke Winery's Woodstock Hill White wine. in Woodstock, Connecticut. The farm has been owned by the Miller family since 1962. This property has been used for farming for over 200 years, and some of the original structures are still in use, including the farmhouse office. We have an innovative milking center and two 390 cow free-stall barn which was completed in November of 2000. We also have a heifer barn at our Putnam location that holds 700 head. The dairy herd at Fairvue is composed entirely of Holstein cattle. Fairvue is currently the home of over 2,300 cattle of all ages from calves to cows. About 1,100 milking-age animals are milked three times each day. The farm employs about 20 full and part-time individuals whose dedication is crucial to ensuring that the cows at Fairvue receive the best care possible. The Miller family members are strong advocates for the preservation of agriculture and open space in Connecticut. Paul, Diane, and David are active in a broad spectrum of community and agricultural organizations including the local Grange, local committees involved with supporting agriculture, the Connecticut Farm Bureau Dairy Committee, and the State of Connecticut Milk Promotion Board. They are also founding members of Very Alive, a non-profit organization dedicated to the promotion of CT agriculture to the Connecticut state government. 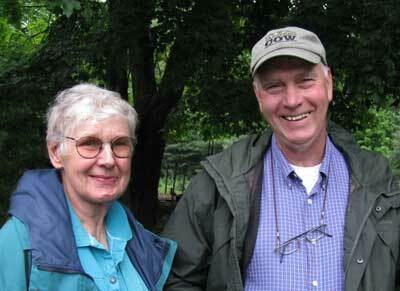 Paul and Diane are part owners of The Farmer's Cow. Fairvue is committed to providing education about the importance that farming has for everyone. The farm participates in an annual event called Celebrating Agriculture the third Saturday after Labor Day, during which it opens its doors to hundreds of visitors, providing detailed guided tours of every aspect of this progressive, environmentally oriented dairy. The farm offers free tours to schools and other groups at various times throughout the year, and welcomes visitors to stop in year-round. The observation area of the milking parlor is always open to those who want to spend some time cow-watching. Fairvue loves to provide people with all types of backgrounds the opportunity to come see for themselves just where milk comes from.